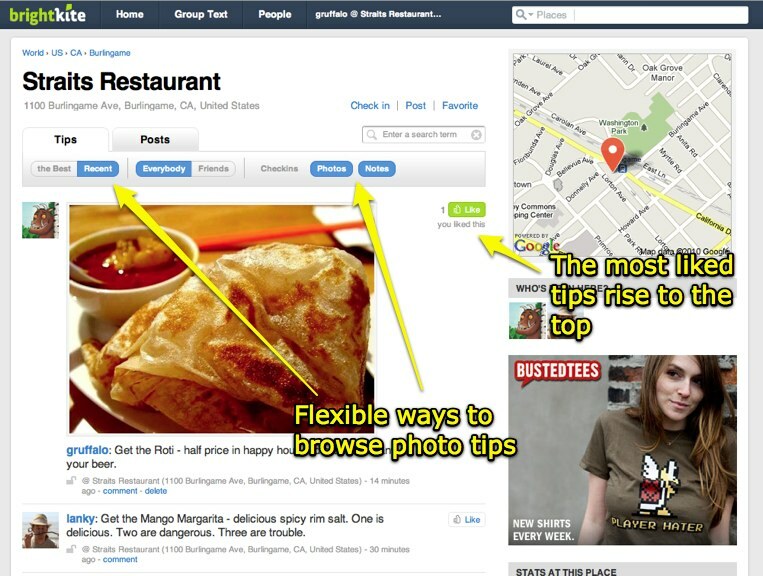 Brightkite is working to be more relevant to the average web surfer using its image-happy almost-food-centric users by allowing them to post tips to venues (Tippety Top. Brighkite launches photo-tips). Oddly, as a Brightkite user, I first heard about this from Mashable (Brightkite Launches Location-Based Photo Tips), and then pestered Brighkite about this until it posted the announcement to the official blog hours later (I’m not implying that I caused Brightkite to post it, I am not that awesome). Brightkite does not share venues with Foursquare or Gowalla, but thanks to its Check.in service, which allows you to check in to all three services at once, we know they are capable of matching places. Unfortunately, the new Photo Tips feature doesn’t leverage the Check.in service (or its functionality), meaning it really won’t lure users from Foursquare or Gowalla to use it in place of (or in addition to) their current check-in and tip-posting behavior on those services. Looking through this new feature, I also cannot figure out how to turn old photos into tips, and while I asked Brightkite on its blog post and via the service (and Brightkite is usually rather responsive), I’ve heard nothing back yet. That means a couple years of tracking food at my favorite local Italian restaurant isn’t being treated as a tip for that venue. New photos can be updated and flagged as a tip right off the bat. Unfortunately, I use a Windows Mobile phone, where there is no Brightkite app, which means I have to email my photos into the service. Using this method, there is no way to flag a photo as a tip, making my first issue more important. How this may integrate with services like Loopt, Foursquare, Gowalla and so on is anybody’s guess. As a user, you really need to have some familiarity with the site to find tips, and there is no indication how they will make this repository available through Google or other similar search engines for users who have never heard of Brightkite. Interestingly, I currently add tips to a venue in Foursquare and add the URL of my Brightkite photo. It’s not efficient, but it’s some way to share the data. I will continue to use that method until I can see how this new feature will actually work.